Making professional looking PowerPoint presentations requires a certain amount of design skill. Many however can get past this limitation thanks to the hundreds of free and premium templates out there. Nevertheless, a template may still require some touch ups and additions no matter how professional or suitable it's to the subject being showcased. This may include simple fixes in layouts and transitions to addition of elements such as diagrams, charts and pictures. iSlide aims to address all these design needs in one place, and what's more, in just a few clicks. 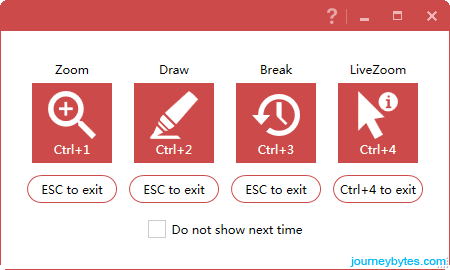 The iSlide add-in is compatible with Microsoft Office 2010 and later (2013/2016/2019/365) and WPS Office Free/Professional running on Windows 7, 8/8.1 or10. After installation, the add-in is accessible within the PowerPoint ribbon just beside the Home tab. 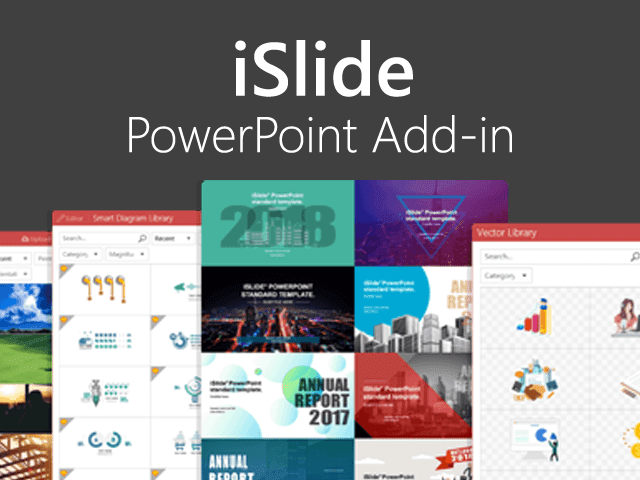 The iSlide tab is packed with most of the essentials needed to design a presentation from start to end. This includes design tools, resources, animations and some specific tools. The idea here is to keep one's focus on designing a complete presentation without the distracting need to switch between tabs every now then. As the name alludes to, Standard Specification provides a quick way to "standardize" a presentation. You can set uniform fonts, paragraphs, guides and colors that can be used in all the slides, selected ones or a slides array (e.g 1-3, 5-10). The Design Layout provide some non-standard layout options that can be used on shapes and pictures. Examples include the matrix and circular layouts that can be used to create interesting designs of various shapes. A watermark tool is also included here that makes adding or deleting watermarks from all or specific slides quick. Other tools include a handy eyedropper tool for picking colors and a crop (resize) tool that crops with units thus allowing for much finer control. Finally, there is the Design Tools which opens a pane with a variety of layout adjustment options including alignment, size, guides layout, rotation and more. 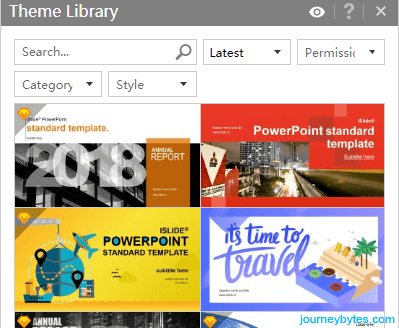 This hosts a huge collection of templates that can be filtered by category (think presentation context), style and permissions (free or premium). The templates can also be searched and favorited for future use . Additionally, one has the choice to download a template in either 16:9 or 4:3 aspect ratio. The variety of templates here is staggering one is almost guaranteed of finding a suitable candidate for their project, be it free or premium. With that said, premium users have at their disposal more variety of templates to choose from. 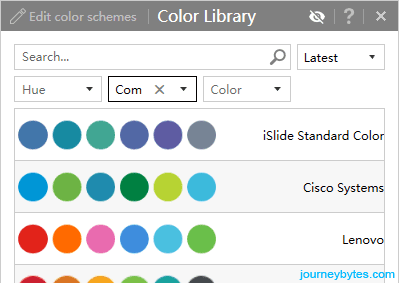 The color library houses a wide selection of color schemes for various sectors. Think company colors and the like. You can search specific color schemes or filter them according to the industry. For instance, in the Computer category, you 'll find color schemes for tech giants such as Google, Huawei and Sony to online services like GitHub and Evernote. The color schemes can be applied directly to all or selected slides. One can also edit a custom color scheme and save them for later use. This library contains a collection of ready to use diagrams. The diagrams have fields to fill with text and may include data placeholders, shapes (vectors) and pictures. 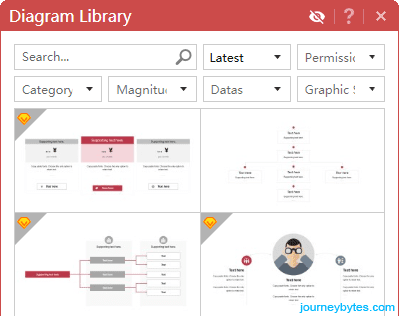 The diagrams can be filtered according to permission (free or premium), category (e.g. list, hierarchy, cycle, pyramid etc. ), contains data or not and whether it has pictures, vectors or is text-only. 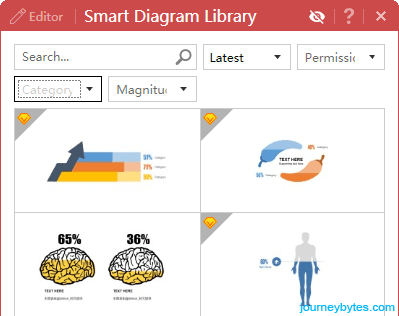 This is similar to the diagrams library but only includes smart diagrams. Likewise, they include fields to fill with one's data. The Smart Diagrams are the equivalent of MS Office's SmartArt however there's a lot more variety going on here and the designs are more graphical. This is offers a huge collection of icons that can be inserted in a slide in just one click. The icons are of high resolution and thus can be enlarged with no noticeable loss in quality. As it's expected by now, the icons can likewise be searched using keywords (e.g. car, office) or filtered according to categories. Interestingly all the icons here are free to use. Premium users however get to upload their icons into their account and can access them at any time by filtering the permission to Private. Pictures when used imaginatively can make a presentation engaging for the audience. 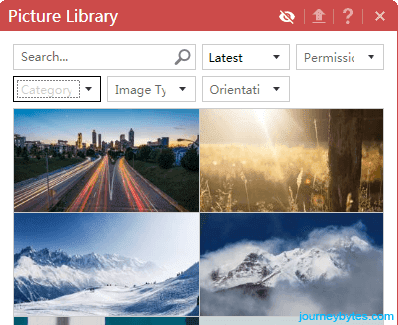 The Picture library offers thousands of high quality pictures that span a multitude of categories and that are sure to meet anyone's needs. In addition to these, the images are searchable and can be filtered according to type (JPG or PNG) or orientation (vertical or horizontal). This quite a time saving resource as it does away with the hassle of finding and downloading pictures online first. The pictures themselves are actually free to use (for both personal and commercial use) as it seems the bulk of them are sourced from free image websites such as Pixabay and Unsplash. For such pictures, a link to the author is thoughtfully included in the preview window should one wish to support or explore more of their artwork. All the pictures here are accessible to both free and premium users and can be added into one's favorites for future use. Premium users can however also upload their pictures into a private collection to use. This library is similar to the Pictures one with the only difference being the images here are of the vector type. Vector images are ideal where large graphics are required as they don't lose quality with enlargement. As such, this may prove quite invaluable for presentations that have to be projected on huge displays. The animation section includes a Smooth Transition tool that creates a transition between two objects (shapes, images, text etc.) within a slide. The process is completely automated - just select the two objects and with one click set the transition. No need therefore to fiddle with direction, timing and specific transitions if one is short on time. Nevertheless, Tween, Scale Time and Sequence tools are provided for those that may want to tweak the transitions to their preferences. Export Images - exports the all or selected slides to individual images. Save as Read Only Presentation - password protects an exported presentation to prevent modification. Export Video - exports the presentation to a video (MP4) using various quality options. Export Fonts - exports the embedded fonts in a presentation. This utility creates an image file with the thumbnails of all the slides in a presentation. The exported image shows an overview of all the slides with the first slide taking center stage at the top. As such this can be quite handy as a presentation summary or when one needs to share the presentation without having to give access to the actual file. As the name suggest, this tool compresses the presentation to save space. 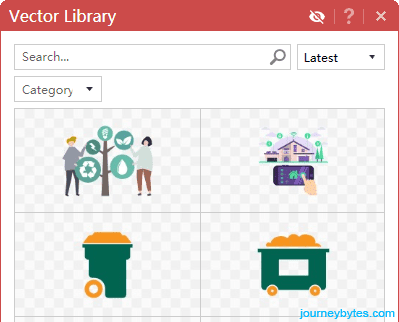 The tool analyses the presentation and gives options to delete particular elements that may be unnecessary such as Notes, Comments, Animations and Invisible or Off-slide content. A compression quality setting for images used in the presentation is also thoughtfully included. File Analytics gives an overview of the slides and the slide master so as to understand how the presentation is laid out and if need be, to edit the master slide. ZoomIt uses the nifty application of the same from Sysinternals to do various zoom functions and drawing on screen. It's quite useful in annotating during a slideshow though admittedly may take some time to get used to. The application is however not included in the package but downloaded separately. Timer on the other hand allows one to time a presentation's duration after which one can adjust accordingly to fit a preferred timespan. Quite a useful tool in situations where the presentation time is fixed. This is a hub with resources to network on presentation design skills. There are tutorials, a bulletin and announcements on the latest developments concerning the add-in. The hub is however currently in Chinese only so at the moment it's impossible to gauge its usefulness with the language barrier. To use iSlide's resources you'll need to create an account and log in. This is completed within PowerPoint and not in your Browswer. During the first run after installing the add-in, you'll be taken on a tour with the option to set up an account at the end. You can sign up with email or phone. A verification code is sent to either of them to verify the registration. After logging in you'll be able to download and use the free resources in your presentations. iSlide's centralizes the process of making a complete presentation by putting the essential tools and resources for this task in one tab. It further uses a modern interface that's simplistic and clutter free, relying on pop-up windows rather than additional tabs to give more options. The result - a more streamlined approach in the design process. The add-in's biggest strength is the resources it puts at one's disposal and with the ease it allows for their use. The resources themselves are of high quality and options are provided to narrow down the search to a suitable resource as well as some cataloguing for future use. 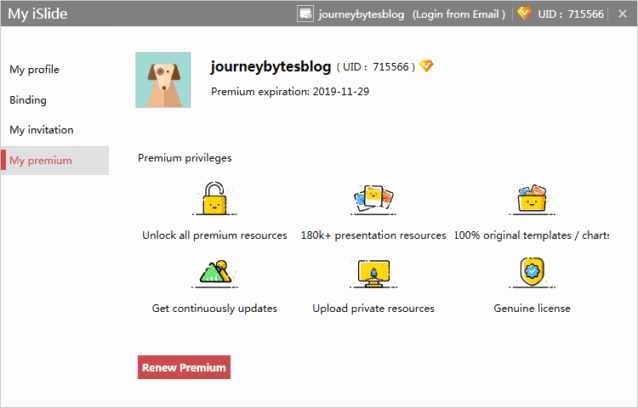 For any individual that makes presentations for a living or on a regular basis, this feature alone is worth considering the upgrade to the premium option. The add-in is however not without some shortcomings, the most glaring at the moment being the localization support. More languages are needed should it hope to take over different markets. The English translation while sufficient need polishing in some parts by using better wording to communicate a feature e.g. Security Export, Join Images (Create Overview Image would for instance be more befitting here). Fortunately, the add-in has help resources accessible via the Window's question marks that should expound on how what a particular tool does. The help articles are however online and so an active internet connection is needed. A minor complaint also is that PowerPoint takes longer to start-up now (~12 secs for me with PowerPoint 2016). Nevertheless, it does make the extra seconds worth the wait. If you're happy with the add-in, you can always upgrade from the Free Edition to a Premium plan. Upgrading will unlock access to the entire collection of resources and also give you the option to upload resources into your Private collection. A comparison of the three editions can be seen here. To upgrade, use the Upgrade Premium button at the far right of the tab's ribbon. That will launch a window with a checkout to pay with PayPal. Should you've any difficulties using the code leave me a message on my contact page.